Love typography? Do you know what typography terms like 'Serif', 'Counter' or 'Arm' mean? ! This deck of 54 cards is ideal for anyone who loves typography. What makes it even more fun is that you can gather friends for a round of poker, all the while learning a thing or two about the 'Anatomy of Type'. Learn all about typography by getting the deck for yourself or a friend today! 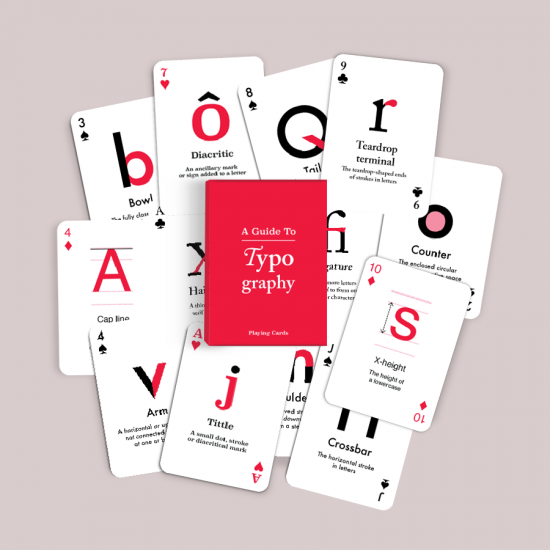 Tell your friends about 'A Guide to Typography' playing cards (Limited stock)!